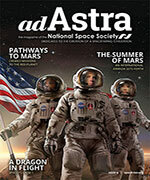 The latest paper in the NSS Journal of Space Settlement is “Paths to Space Settlement” by Al Globus. A number of firms are developing commercial sub-orbital launch vehicles to carry tourists into space. Let’s assume they attract many customers and become profitable. The next, much more difficult, step is to develop orbital tourist vehicles and space hotels to go with them. These hotels will require maids, cooks, waiters, concierges and so forth, some of whom may decide to stay, becoming the first permanent residents in space. A luxury hotel plus good medical facilities could provide low-g living for wealthy disabled individuals where wheelchairs and walkers are unnecessary. In the meantime, humanity could choose to solve, once and for all, our energy and global warming problems by developing space solar power. To supply a substantial fraction of civilization’s 15 TW energy consumption would require an extremely large number of launches, the ability to build extremely large structures in orbit, and eventually tapping the Moon and Near Earth Objects (NEOs) for materials to avoid the environmental cost of mining, manufacturing, and launch from Earth. The first step towards NEO mining is to locate them. As a large fraction, roughly 30%, of these will eventually impact Earth, locating and characterizing the NEO population is essential for planetary defense. Furthermore, it would be prudent to deflect a representative set of non-dangerous NEOs to insure that we know how to do it should a NEO on an imminent collision course with Earth be found. A representative set would include at least one of each major type of NEO since these have different physical properties and thus may require different deflection techniques. This would give orbital space settlement designers a known source of materials and the means to move them if necessary. 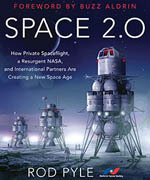 If these paths are taken, each step of which is justified in its own right, humanity will have excellent launch, small orbital living facilities, the ability to build large objects in orbit, and access to extra-terrestrial materials — most of what is needed to realize Gerard O’Neill’s orbital space settlement vision. At that point, some extremely wealthy individuals may build themselves a small orbital habitat so they live only with like-minded individuals. The first, and most difficult, orbital space settlement will be built. These are paths to space settlement.